A decorative piece with beautiful accents, the Belfair Collection is Quoizel Naturals at its finest. The circumference of the vertical bars enclose an oyster mica shade and etched diffuser. 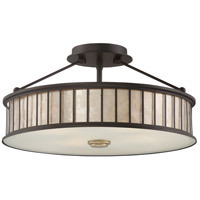 The Western Bronze finish is deep, accented with painted brass on the finial and fixture arms.